Schiff: Evidence Of Collusion Is "Compelling" [VIDEO] - Joe.My.God. House Intelligence Committee Chairman Adam Schiff (D-Calif.) is pushing back against Senate Intelligence Committee Chairman Richard Burr (R-N.C.) assertion that the Senate panel has not found evidence of collusion between President Trump’s campaign and Russia. Schiff said Sunday on CNN’s “State of the Union” that there is “pretty compelling evidence” of collusion during the 2016 election. “You can see evidence in plain sight on the issue of collusion, pretty compelling evidence. 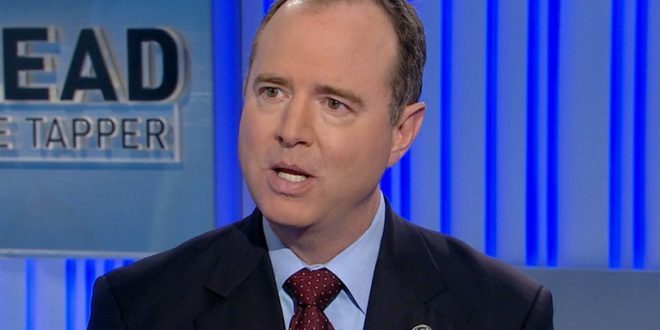 Now, there’s a difference between seeing evidence of collusion and being able to prove a criminal conspiracy beyond a reasonable doubt,” Schiff said.